YouTuber Daniel Perdomo and his friends made one of the coolest video game replicas of the year so far. 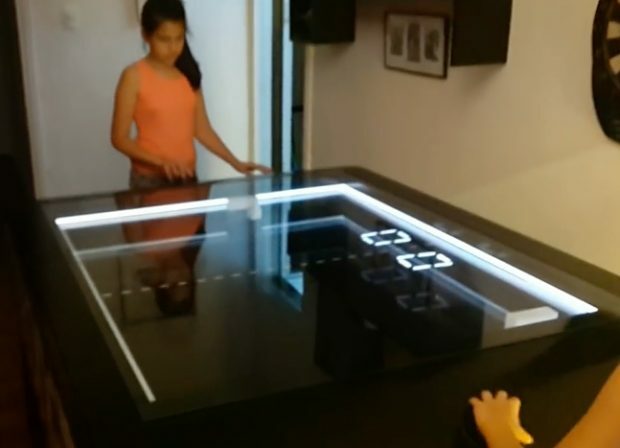 It’s a physical replica of the classic game PONG. It’s basically a magnetic, mechanical version of air hockey. The ball moves back and forth not due to the force from the paddles but because of a magnet below the glass surface. An arm moves the magnet along the x and y axis. A couple of Arduino microcontrollers handle how the ball behaves when it’s “hit.” It even seems like you can play against the table, or have it control both paddles for an ancient Let’s Play session. A pair of hard drive platters were turned into rotary encoders to mimic the Atari knob controllers. The scoreboard, interactive LEDs around the playing field and graphics on the side of the table complete the homage. You can skip to 4:03 in the video below to see the finished table, or watch the whole thing to see how it all came together. I hope it has the table makes PONG‘s blip and buzz sound effects too. Hack A Day says Daniel and his co-creators are looking for investors and business partners so they can start an arcade machine business to sell more units.